Does Apple really own Coverflow and Time Machine Concepts? Mirror Worlds LLC filed the lawsuit in 2008, alleging that Apple had infringed on patents for creating "streams" of documents sorted by time. According to Bloomberg, a federal jury sided with Mirror Worlds on Friday, although specific details of the ruling were unavailable. Mirror Worlds’ patents were based on research by Yale professor David Gelernter and then-doctoral student Eric Freeman. Gelernter emerged as a prominent computer scientist in the 1980s, eventually developing a time-based method of organizing data that he dubbed "lifestreaming." Patents for the concept date back as early as 1999 (1, 2, 3, 4). In a March interview, Gelernter told Big Think that though he no longer held the patents for the suit, which he was told is the "largest lawsuit in patent history," he was still upset about not getting credit for the ideas. 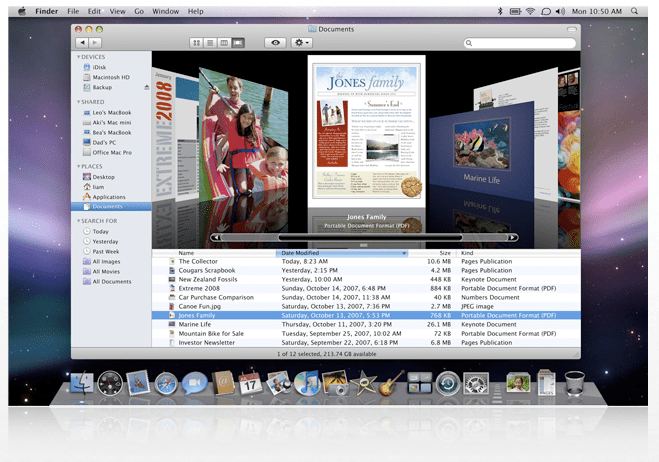 Gelernter sees the Mac OS X features Spotlight and Time Machine, as well as the iTunes Cover Flow feature, as being taken from his ideas on "lifestreaming." This entry was posted on October 2, 2010, 12:22 PM and is filed under Apple, Computers and Internet, News, Patents. You can follow any responses to this entry through RSS 2.0. You can leave a response, or trackback from your own site.